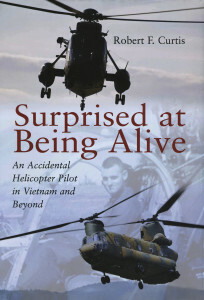 Surprised at Being Alive: An Accidental Helicopter Pilot in Vietnam and Beyond. Robert F. Curtis. Casemate Publishers. 297 pages. $32.95. Robert F. Curtis’ Surprised at Being Alive chronicles his years of service in not only the U.S. Army but also the Kentucky National Guard, U.S. Marine Corps and U.K. Royal Navy. With accounts of more than 20 years of service, the book is aptly titled. Still in high school in the spring of 1968, Curtis was in the zone to be drafted. To have some control over his service, he enlisted in the Army to learn to fly—and fly he did. After completing his training, his first assignment was flying Chinook helicopters in Vietnam, the heavy haulers used extensively in the war zone to move personnel, heavy mortars and supplies to the units in the field. He is very defensive about helicopters, cautioning against using the term “chopper” because the pilots “do not like the image of rotor blades doing anything except lifting the aircraft.” Throughout the book, his wry sense of humor is evident. On one of his missions to carry supplies to troops at the Laos border, his windshield was hit with small-arms fire. At that moment, Curtis was fortunately looking down at gauges and not straight out the cockpit. Otherwise, his wounds would have been much worse. He was able to land the aircraft, and his crew immediately took defensive positions around it. The copter was not fatally harmed, but it could not be flown. A Huey had seen them go down and came back to pick them up. Within four hours of being hit, they were out of Laos and back in Vietnam, and Curtis was on his way to three weeks of home leave. On Aug. 7, 1971, he flew his last combat mission. He never flew a Chinook again. His next step was to go to school at the University of Kentucky. To augment his grant under the GI Bill, he signed up to fly with the Kentucky Army National Guard. His assignments included overflying a truckers’ strike and pulling relief and recovery missions after a tornado hit, keeping irate citizens at bay and piloting the governor and the state National Guard commander to survey the damage. After two years of National Guard duty while he finished college, Curtis was off for another adventure. He applied to law school and was accepted, but he turned it down to continue flying: “You are never too old to go to law school, but you can get too old for flying.” This time, he joined the U.S. Marine Corps to fly Hueys with a special operations-capable unit. All of his adventures, from learning to use night-vision goggles to landing on and taking off from an aircraft carrier—the USS Guam and later the Nassau—to training missions in the mountains of Greece and the beaches of Morocco, are recounted in detail and with humor and wonderment. Near-misses continue to strengthen his belief in “luck and superstition” to cheat death another time. By January 1984, Curtis was detached from the Marine Corps and off to exchange duty with the U.K. Royal Navy, flying in support of the Royal Marines. His duties involved NATO exercises in the fjords of Norway and the task of flying off British carriers in the rough seas and cold temperatures. One exercise involved hovering over a sub to transfer two senior officers from the sub to the carrier. He accomplished the mission, but not without some nervous moments as the sub bobbed in the water and the copter hovered. The exchange duty with the British ended, and Curtis found himself in Washington, D.C., attending the Defense Systems Management College at nearby Fort Belvoir, Va. He had survived his flying days. Not everyone is so lucky, of course, and Curtis writes with feeling of those whose luck ran out. He dedicates his last chapter, the epilogue, to those whose names are on the Vietnam Veterans Memorial Wall, many of them his friends who are forever young. Surprised at Being Alive is an easy-to-read account of one man’s adventures as a pilot. He recounts episodes of danger tempered always with his sense of humor. Curtis’ tales will speak to both those who have and have not been there. To those who have been there and done that, it will bring back their memories. Nancy Barclay Graves is a freelance writer who lives in Arlington, Va. The Direction of War: Contemporary Strategy in Historical Perspective. Hew Strachan. Cambridge University Press. 336 pages. $29.99. Eminent historian Hew Strachan has turned his hand from studying World War I to considering policy and strategy in the contemporary era. As Chichele Professor of the History of War at Oxford University, his mandate extends beyond operations to the study of policy and strategy. The Direction of War is a collection of essays and lectures that reflect his thoughts about the history of warfare, specifically focused on strategic thinking. Strachan’s thesis is that strategy—and how it is understood—continues to matter. He argues that there is evidence of shallow thinking and confusion among policymakers in the U.S. and the U.K. during the last decade and a half, resulting in mistaken policy and ineffective strategy. Strachan unabashedly relies on Carl von Clausewitz for the theoretical underpinning of his own thinking about the direction of warfare. Strachan’s work is reminiscent of David Hackett Fischer’s Historians’ Fallacies: Toward a Logic of Historical Thought. He does for sloppy thinking about strategy what Fischer did for sloppy thinking among historians. First and foremost, Strachan asserts that contemporary historians and political scientists often misread Clausewitz. In doing so, they miss essential context and are therefore guilty of anachronism. For example, he believes that Clausewitz is misunderstood with respect to civilian control. The norms for modern democratic powers such as the U.S. and the U.K. should not be applied to what Clausewitz thought about 19th-century Prussia, yet they are. The attempt to isolate military advice from policy that has become de rigueur in the U.S. is a post-World War II phenomenon and based in part on misreading Clausewitz. Policy, he says, is a matter both for politicians and soldiers. Those who may perceive a consequent threat to civil authority may rest easy. Strachan is not proposing anything dangerous to civilian authority but rather suggesting means to address both conceptual and institutional weaknesses in policymaking. The heart of the problem in the Anglophone powers, at least, is confusion over just what strategy is. The term is used to describe mundane, even trivial, matters. Everything from baseball to running a small business allegedly requires strategy. That may be so, but national strategy needs to be differentiated from how to plan the pitching rotation of the Kansas City Royals. Further, when strategy is used to describe national intentions, it is often conflated with policy. Strachan suggests mistaken taxonomy leads to exaggeration, misapprehension and confusion. For example, he points out that terror is a weapon and not an enemy. Further, he argues that describing the current condition as the “long war” contributes to the confusion because it fails to clarify. President Barack Obama quite rightly eliminated the official use of the term global war on terror but replaced it with the equally unhelpful rubric of counter-terrorism. Even Strachan cannot bring himself to name the thing that the U.S., U.K. and others confront. If the enemy cannot be named, how are policymakers to confront the enemy on the battlefield or in the realm of ideas? The body of his argument with respect to Clausewitz and the development of strategic thinking in the West ranges far and wide, always with precision. 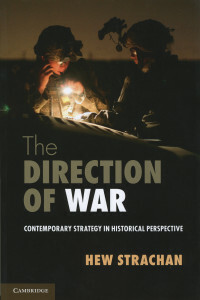 His second and third chapters focus on historical perspectives in strategy and contemporary understanding of Clausewitz. Both are brilliant. Military professionals and would-be policymakers should read them early in their careers. He effectively debunks the ideas in vogue at the end of the Cold War. These include the several variations on the revolution in military affairs and their transformation. The essence of his argument is that policy defines the end or objective, while strategy defines the means to achieve them. According to Strachan, operations that do not serve as links between strategy and policy will not produce success, as events in Iraq and Afghanistan surely show. Strachan explores where contemporary understanding or misunderstanding of Clausewitz has led. In the U.S., the atom seemed to define the end of history at one point in time. Atomic weapons appeared to rule out a strategically significant role for conventional forces beyond precluding escalation to nuclear war. The operational level of war emerged in part to describe what conventional forces might do short of nuclear exchange. The problem is that the operational-level war failed to link strategy and policy. As a consequence, operations tended to be perceived in isolation from policy and strategy. His criticism—the U.S.’ tendency to isolate military advice from policy in Iraq and Afghanistan—is painful to read but on the mark. There is much more, and all of it is worth taking the time to read and consider carefully. Reading this book is no easy task, however. Some passages will have to be read more than once. Because the various chapters stem from different efforts over time, the result is not entirely coherent, but is worth the effort. Strachan’s diagnosis of the cause of the malaise in strategic thinking is sound. His prescription for curing the problem is that soldiers and policymakers should revisit theory and reform institutional processes. Policymakers are unlikely to take that medicine, but soldiers can learn to offer military advice with an eye to policy. At the very least, soldiers can learn not to assume they operate in entirely different and unconnected spheres from policymakers. Strachan’s conclusion that the post-World War II model of isolating military advice from policy produces a “clash between the theory and what happens in practice” rings true. Soldiers can—and should—consider how to reconcile theory and practice. The War that Forged a Nation: Why the Civil War Still Matters. James McPherson. Oxford University Press. 224 pages. $27.95. As historian Shelby Foote declared, “The Civil War defined us as what we are and it opened us to being what we became, good and bad things.” Five generations after its conclusion, the long shadow of the war still affects us. In an effort to answer why the Civil War remains relevant, James McPherson has released The War that Forged a Nation: Why the Civil War Still Matters on the sesquicentennial anniversary of Confederate Gen. Robert E. Lee’s surrender at Appomattox Court House and the assassination of President Abraham Lincoln. McPherson is well-known to the readers of ARMY magazine. He is the George Henry Davis 1886 Professor Emeritus of United States History at Princeton University. 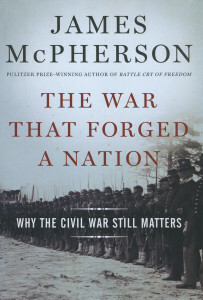 The pre-eminent historian of the Civil War, McPherson has published numerous volumes of the conflict, including Battle Cry of Freedom: The Civil War Era, which won the Pulitzer Prize in 1989; Abraham Lincoln and the Second American Revolution; Embattled Rebel: Jefferson Davis as Commander-in-Chief; and For Cause and Comrades: Why Men Fought in the Civil War, which won the prestigious Lincoln Prize in 1998. Meticulously researched, provocative and authoritative, McPherson’s latest work is a fitting culmination of a half-century’s research. In his examination of naval warfare, McPherson concentrates on two Union admirals, Samuel F. Du Pont and David G. Farragut. Both sea captains achieved early success in the war. Du Pont won the most important Union victory in 1861 by reducing the forts at the entrance of Port Royal Sound in South Carolina. This led to the capture of the South Carolina and Georgia sea islands. Meanwhile, Farragut, commanding the West Gulf Blockading Squadron, captured New Orleans. By 1863, however, the careers of Du Pont and Farragut markedly diverged. McPherson opines that the “character traits and qualities of leadership” displayed in 1863–64 explain why DuPont “faded into obscurity” and Farragut “emerged into greatness” as the Union navy’s foremost hero. Du Pont’s “tragic flaw … was his unwillingness to take large risks” and then refuse to take accountability for his failures. Farragut, on the other hand, was willing to risk his fleet and his reputation on the effort to achieve victory. To illustrate his thesis, McPherson contrasts Du Pont’s hesitancy in the attempt to capture Charleston in 1863 to Farragut’s victory at Mobile Bay in August 1864. McPherson opines that McClellan’s “bitter enemies” whom he had “crushed” were not Confederates but instead other generals in the Union army and high officials in the U.S. government—Gens. Winfield Scott, John Pope and Irvin McDowell, and Secretary of War Edwin M. Stanton, who had wanted to cashier McClellan. McClellan’s language mirrors that sentiment. While he described the Confederates as mere “rascals,” he classified his enemies in the Union Congress, administration and Army as “heartless villains … wretches … incompetent knaves a most despicable set of men.” In the end, Lincoln finally relieved “tardy George” from command of the Army of the Potomac on Nov. 7, 1862. Snow & Steel: The Battle of the Bulge, 1944–45. Peter Caddick-Adams. Oxford University Press. 872 pages. $34.95. 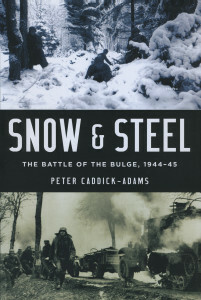 Peter Caddick-Adams has taken on a considerable task in attempting to tell the full story of the Battle of the Bulge. At almost 900 pages long with 723 pages of text, his attempt is laudable and generally successful. This book is similar to John S.D. Eisenhower’s magisterial 1969 work, The Bitter Woods: The Battle of the Bulge, in that it effectively balances German and American accounts of the battle. Scholars will certainly appreciate the bibliography and the author’s effort in using primary accounts. The book is broken down into four parts. The first three focus on the battle, but unfortunately, the book repeats the methodology of virtually all previous works on the Bulge in weighting the coverage overwhelmingly in favor of events up to the relief of Bastogne. For example, few pages are devoted to the month of January 1945, a month in which Third Army sustained the vast majority of its casualties. This emphasis on the relief of Bastogne unfortunately leaves the reader with an incomplete sense of many operational issues faced by both sides throughout the month of January. Operation Nordwind is covered, but its relationship to Field Marshal Walter Model’s transfer of combat power to Gen. George S. Patton Jr.’s sector at the same time is not discussed in detail. Although Caddick-Adams’ prose is highly readable, the narrative bounces back and forth out of time sequence. Many readers may very well enjoy this stylistic approach, but some may have difficulty following timelines. Part Four does not add to the analysis of the battle. Instead, the author focuses on the subsequent push to Berlin and a discussion of how NATO would have defended against the Warsaw Pact in the Ardennes area. A section on reputations is interesting, and the short treatment of Bulge historiography is useful. Caddick-Adams makes several statements that will surely generate debate, and that is a good thing. For example, scholars will find it odd that the war in Europe had apparently become only one of attrition by January 1945. Moreover, some readers will accept the author’s contention that the Germans could never have reached the Meuse River. Others will look at the penetration of some 60 miles in eight days and ask, “Why not?”—especially had the Germans adopted a different scheme of maneuver and main effort at the beginning. Another point of debate will be the author’s claim that Hitler did not realize that the war had become one of Materialschlacht (warfare fought predominantly using materiel). This statement is actually tied in nicely with a discussion of Hitler’s overreliance on technology to achieve decisive results. Hitler’s faith in technology was proven false. Our faith in technology was no less intense, but as the author points out, the Allies had sufficient numerical and materiel superiority to backstop the introduction of new technology. The only significant issue that readers should be aware of concerning Caddick-Adams’ treatment of the human element is his acceptance of S.L.A. Marshall’s thesis that less than 25 percent of U.S. infantry fired their weapons effectively as a result of battlefield stress. Numerous studies have contested Marshall’s findings, and Caddick-Adams might have addressed this issue better. The only significant error of fact I came across is his statement that Patton’s counteroffensive started on Dec. 24, 1944, when it clearly began on Dec. 22. Moreover, he states that the Third Army counteroffensive toward Bastogne was sustained over three days, when in fact it took five days to relieve the town. It is always difficult to effectively balance descriptions of men struggling for survival with the range of operational activities at division, corps, Army and Army group levels. The author does as well as can be expected given the scale of the subject. He offers several hypotheses that warrant testing and evaluation. Overall, Snow & Steel reads well and will be enjoyed by the general reader. Moreover, professional soldiers and military theorists will benefit from considering and testing Caddick-Adams’ positions. Capt. John N. Rickard is the author of Advance and Destroy: Patton as Commander in the Bulge. He currently serves in the Army Professional Military Education section of the Canadian Army Command and Staff College in Kingston, Ontario.